So, you think you're funny? Funny like a clown?... 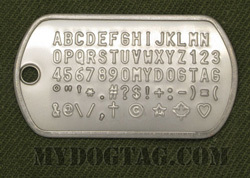 Have fun with your dogtags by reflecting your sarcastic nature or by adding a clever inside joke. 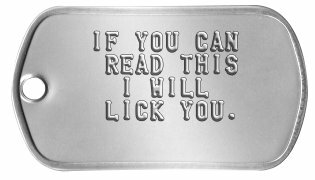 People always want to read what's on someone's dogtags, so this is a great way for everyone to have a laugh with it. WARNING! I am silently correcting your grammar. I may be left handed, but I am always right. All of my kids have paws. 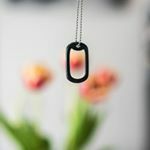 Customize to Buy your Humor Dog Tags now! All orders are shipped within 1 business day and are usually delivered within 1 week (in North America). 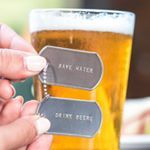 If you need any assistance creating or ordering your Humor Dog Tags please contact us directly, we are here to help!